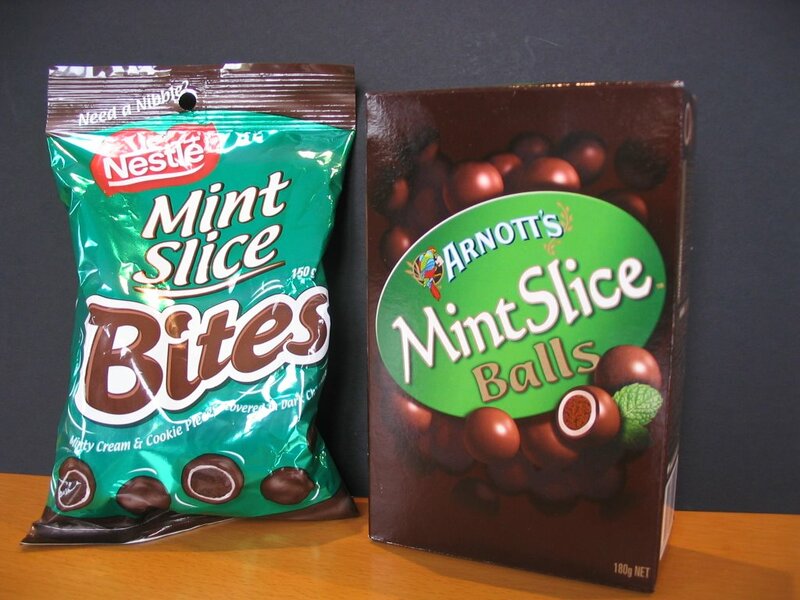 Yet it may surprise you to know that Arnott's does not have a Trade Mark for the words "Mint Slice". Registration of the mark was refused by a Hearing Officer of the Australian Trade Marks Office (now IP Australia) in June 1998. You can download the decision as a PDF here. In summary, the officer found that the words "mint slice" were not capable of distinguishing the applicant’s (Arnott's) goods. Obviously they didn't ask members of my family... when my wife and daughter (both self-confessed chocaholics) hear the words "mint slice", they immediately and unequivocally call to mind goods from a particular source, namely Arnott's. It turns out that Arnott's had in fact conducted and submitted a survey of 1200 Australian consumers which found: (1) 69% of people who said they were familiar with Mint Slice recognised Arnott's as the manufacturer; and (2) of those who were aware of Mint Slice and said they knew which company manufactured it, 91% named Arnott's. Pretty convincing, you might think? Apparently not to the the Hearing Officer, who seemed more concerned with the 7% of respondents who associated the product with two manufacturers other than Arnott's, and rejected the (very plausible, in my view) explanation that these respondents had done so in error, or were simply guessing. 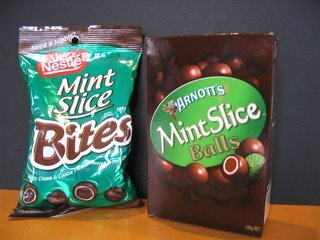 As a result, Arnott's has no claim under the Trade Marks Act to prevent competitors like Nestlé from using the words "Mint Slice" on its "Mint Slice Bites". Interestingly, Nestlé even uses the words "Mint Slice" on the packaging in the same manner as it uses the brand names "Kit Kat" and "Violet Crumble" on other products in its "Bites" range. So, Arnott's has strong brand awareness for "Mint Slice" - more than enough to convince Unilever of the benefits of co-branding (it has done the same with another famous Arnott's brand, "Tim Tam") - but can't prevent others from hijacking that equity. This is another powerful demonstration of the disconnect between the Trade Marks system and the realities of marketing and consumer response. However, it's also a salutory lesson in the difficulties you are likely to face if (under the current Trade Marks system) you choose to build a brand around a name that could be construed as "descriptive", as discussed on this blog a few weeks ago.